Monday, July 23 through Monday, August 6, excluding weekends. Permits MUST be purchased at the CHAMBER OFFICE located at 12 Municipal Drive in Park Hills, Missouri. 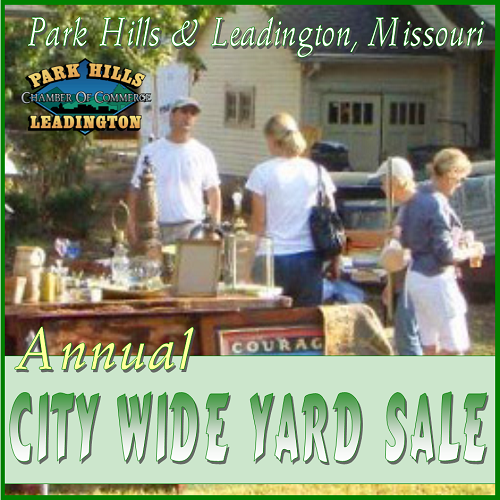 Park Hills residents must purchase a permit in order to sell. Leadington residents are not required to purchase a permit to sell, however, to be included in the map and advertising opportunities, a special permit is required. $5.00 - Basic Option: Includes Sellers Permit and Address is Placed on a List of Area Sales. $10.00 - Premium Option: Includes Sellers Permit and Address is Placed on a List of Area Sales, and is Pin-Pointed on a Local Street Guide, and is Allowed to List 5 Items of Sale. NEW FOR 2018 - $25.00 - Vendor Option: Allows businesses or organizations the ability to offer spots on their parking lot for other vendors to sell items. Includes Sellers Permit and Address is Placed on a List of Area Sales, and is Pin-Pointed with a SPECIAL POINT on a Local Street Guide, and is Allowed 10 LINES of TEXT. Permits MUST be purchased at Chamber Office. Does NOT count toward resident's annual yard sale limit in Park Hills. Permits will be sold during office hours, July 23, 2018 - August 6, 2018. All permits MUST be purchased by August 6th in order to be included on the Map. Maps will be available for purchase August 8, 9, & 10 for $1.00 at both the Chamber Office & Park Hills River Mart. Maps will also be available at Park Hills River Mart on SATURDAY! 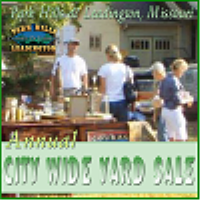 The City Wide Yard Sale info will be published in The Daily Journal’s “Community Calendar” & “Yard Sale” sections; on two local radio stations; on the local cable channel, and the Chamber’s Website and Facebook Pages as well as on posters placed throughout the two towns. All permits must be purchased prior to 4:30 p.m. Monday, August 6th. Visit the Chamber Office at 12 Municipal Drive in Park Hills to purchase a permit or call 573-431-1051 for more information.